You might say that this is just another beach in Lombok and that you’ve seen enough of them. But you’re actually wrong. While there are, indeed, plenty of beaches there (it is an island, after all), they all have something unique and beautiful to offer to the foreigners. Same goes for the Surga Beach. I’ve been around the globe; yet, I still find every single new discovery to be exciting and love to open myself to new experiences. By the way, in Indonesian, Surga means heaven; yes, you’ll get your fair share of paradise once you arrive at the destination. The locals aren’t used to giving big names to average spots; so, get yourself ready for a nice treat. The bay where you’ll find the Surga Beach looks marvelous, and it will take you one step into the white sand to feel like you belong to this place. There are hills all around the beach, creating that classical tropical island atmosphere that we all love in our big, cramped up cities. The beach isn’t really that long – only 600 meters – but there’s enough space to walk around and even to jog. White sand is everywhere; try to take your shoes off and let your feet feel the warmth of the sand. The locals are used to being barefoot, and, according to the scientists and doctors, that makes their bodies stronger because of the connection with Mother Nature. The Surga Beach is equally calm and noisy: it all depends on the time of the day. Early in the morning, the only thing you’re going to hear is the sound of the waves (and the birds singing up in the trees). However, during the day and the evening, more and more people will show up, turning the place into a crowded party. The beauty, affordability, and friendliness of Lombok attract huge numbers of tourists every year. Spots like this one are more suited for people with families and single folks that want to run away from their routine lives and find something to get inspired by. The Surga Beach will be ideal for that. You can walk, swim, surf, lie in the middle of the sand, sit in the shade of a tree, or just enjoy a delicious meal. You won’t ever feel bored or tired because there’s always something going on in Lombok. Festivals, ceremonies, tours, get-togethers – the list goes on and on. I mentioned the hills earlier. Well, if you’re up to it, it would be a good idea to climb one of them. They are located in the right corner and offer some of the best views on the island. Even if you’ve never climbed anything in your life, the climb will take no more than 10-15 minutes. On top of the hills, there are several incredibly comfortable berugaks where you can chill for a moment and catch your breath. When the wind is blowing in your face and the waves are calling, everything else stops to matter. And for that, the Surga Beach is one of the favorite spots on the globe for the international surfers. Even though the waves are calm most of the time, you’ll be able to find “angrier” ones all-year-round. If you consider yourself to be a pro surfer and are always looking for a new adventure, a new journey on your board, then try to visit this beach during the June-October period. That’s when the waves are high, steep, and dangerous. The beginners will appreciate the “easy” waves that will be there during the rest of the months. Now, while the Surga Beach is not nearly as popular as, say, Kuta or Senggigi (those two are known as the most famous spots on the island), it does have a strong fan-base that finds it perfect. Swimming, surfing, and sightseeing – those are the main attractions of this place. So, even if you’ve never been a fan of water activities and don’t like the noisy and somewhat trashy atmosphere of Senggigi, give this beach a chance – you might end up falling in love with it. For the locals, it’s a place where they can be alone with their thoughts and get inspired by nature. For the tourists, It is a heavenly beach that’s equally calming and thrilling. Pantai Surga, as the locals like to call it, is located very close to the Kaliantan Beach and the Ekas bay. Make sure to check out my detailed reviews of both for more info, but for now, let me just say that your trip to Lombok will be even more exciting if you get to see all three spots. The Kuta Beach is a bit further away, but still reachable, even on foot. This entire area feels different from the rest of the island, as it’s got more of the “harbor charm”, as some people put it. The fishermen fish, the kids run around and play, and the foreigners boost the economy better than any government initiative. The Surga Beach is right at the center of it all. Now, as this is a tropical island, no sweater will ever be needed. Grab some of your favorite clothes, a hat, a sunblock, and sunglasses – that’s pretty much all you’ll need on this trip. For swimming, it would be wise to have something to change into. Unfortunately, there aren’t any public places where you can get properly changed. So, improvise a bit and find a quiet and shady enough place among the rocks for that. 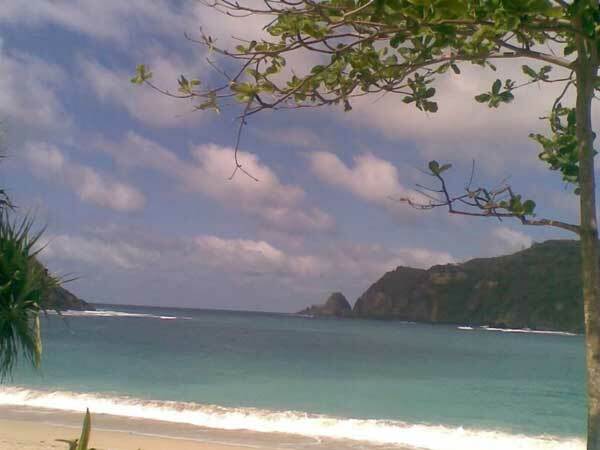 For surfing and snorkeling, the Surga Beach is perfect. However, you’ll have to bring your own gear, as no person in this area will be able to rent you his/her equipment. I’m talking about official renting offices, of course. This is the most important thing on a getaway trip: fun. And you’ll get plenty of that on this beach. But it’s a more “mature” kind of fun, the kind that doesn’t include tons of alcohol and partying till 6 in the morning. For that exact reason, the Surga Beach is still one of the least popular landmarks in Lombok. That means it’s very clean and looks natural, which is great. And the fact that it’s not yet known to a wide audience only makes it that much more attractive for tourists looking for a peaceful, laid-back kind of time on the island. First of all, it is located in the lower right corner (check out the map at the bottom). Second, it’s not as “hyped up” as the Senggigi Beach that I mentioned earlier. On the other hand, the Jerowaru District is very beautiful and tropical, definitely worth a visit. The road to the Surga Beach can be challenging, and the beach is covered in rocks of all shapes and sizes. The March-May period is probably the best time to visit (unless you’re a surfer, of course). There aren’t that many cafes/restaurants and hotels/guest rooms near this place, but you won’t have a problem finding a room to crash in for the night – might just have to walk around a bit. I have to also mention that the beach is home to all kinds of seaweed, corals, and fish. The locals collect pearls and sell them along with the seaweed, thus taking care of their families. Ok, finally, let’s see how we can get to this place and where it is located. So, the exact address is Nusa Tenggara Bar. 83672, Pemongkong, Jerowaru, Kabupaten Lombok Timur. On the map, it is not that far from the Lombok Airport, but in reality, you’ll have to drive for about 1 hour and 30 minutes to get there. From Mataram, the capital, the ride will take even more time: up to 2 hours. On the bright side, if driving through a lovely tropical island is what you’re looking forward to, then you’ll welcome this long trip. For that, rent a motorbike and head towards the destination. Or, if you feel tired, pay a taxi driver and let him take care of the driving. Unfortunately, no public transport goes that way, but come on, who uses a public bus or other transport when traveling to a tropical island, right? Just remember that during the rainy season the bad roads I mentioned earlier will be even more challenging. I really hope that in time, this place will become more popular and the government will improve the infrastructure. The potential is definitely there. Ok, that’s everything I wanted to tell you about the Surga Beach. Take care of yourselves and never lose the spirit of a true adventurer! I'm not big on parties, which is why the Surga Beach is perfect for me. Will most definitely visit it this year! For a couple of days, Surga is nice. As the author suggests, it would be wise to visit several islands during one trip to get the most of it. Even though it lacks a bit on the infrastructural side of things, the natural charm is still there. Honestly, I wasn't impressed. I love when a beach is crowded, and that wasn't the case here. For taking pictures, it's awesome, but not for anything else. For me, Kuta is more fun and lively, while Surga is all about peace and solitude.